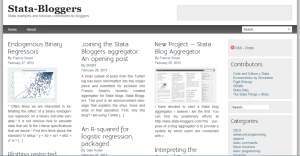 I have a new theme running on Stata-Bloggers. I think this "professional" theme will serve nicely at organizing the aggregated posts into a nice magazine style layout. Any comments or suggestions as towards how best to organize the layout would be appreciated. As for blogs that the aggregator is aggregating across, there currently are six blog contributing to the aggregator including this one. A prominent blog not included in the aggregator is NotElsewhereClassified (the official Stata blog). They have declined inclusion. I am interested in collecting more blogs but am unaware of some of the blogs out there. If you have any suggestions, please post them as comments on the bottom of this link.